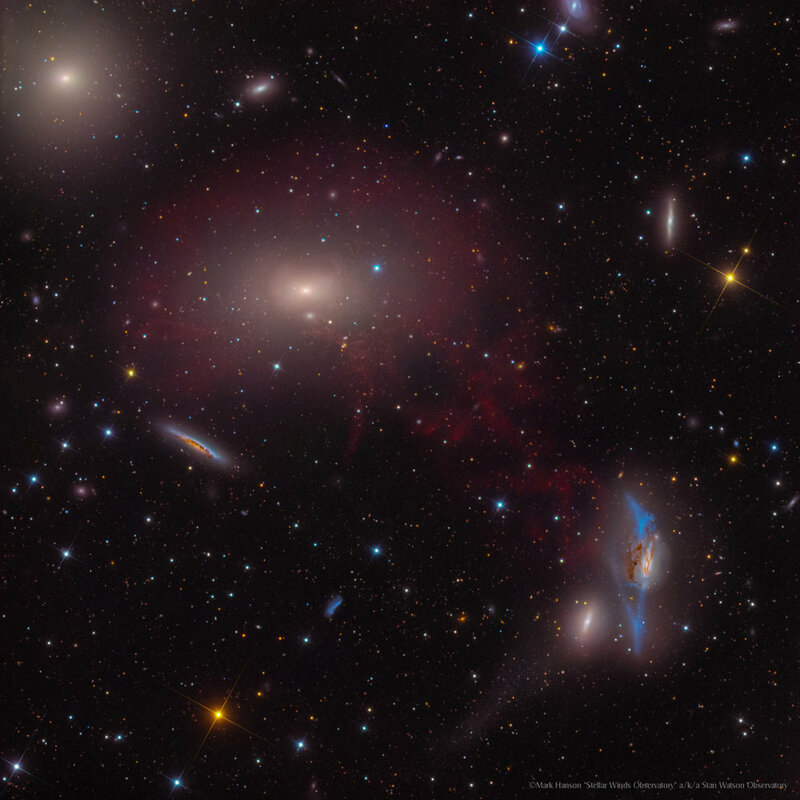 "This stunning image depicts the dynamic and dramatic centre of the Virgo Cluster. At a distance of approximately 50 million light years, it is the closest galaxy cluster to Earth and is dominated by the large elliptical galaxies M86 and M84. However what makes this image special is the addition of 30 hours of narrowband Ha exposures that illuminate blazing filaments of gas that emit in the hydrogen alpha line! These are the product of a collision between M86 and the blue peculiar deformed spiral galaxy NGC 4438. With a staggering length of 400,000 light years, they signify the tempestuous relationship between interacting galaxies at the heart of galaxy clusters. NGC 4438 is also interacting with its elliptical companion NGC 4435 and both are collectively catalogued as Arp 120 in the Arp Atlas of peculiar galaxies. Another sign of peculiarity is a rarely seen tidal tail extending from NGC 4435. Another point of interest is a swarm of low surface brightness dwarf galaxies enveloping M86. These are currently being analysed by professional astronomers to help gain insight into the nature of the elusive dark matter purported to exist within the framework of cosmological models." Description and Labeled version by "Sakib Rasool"